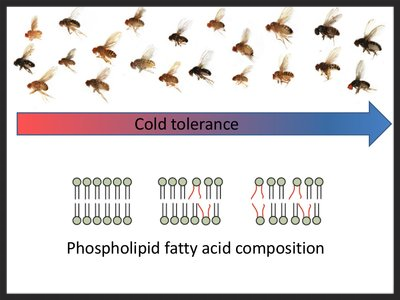 The paper: “Tropical to subpolar gradient in phospholipid composition suggests adaptive tuning of biological membrane function in drosophilids” is now published. This paper concerns the structural modiﬁcations in cell membranes that modify its physical properties to secure suitable ﬂuidity at diﬀerent temperatures. Such adaptive mechanisms in phospholipid fatty acid (PLFA) composition have never been examined via a multispecies approach including appropriate phylogenetic analysis. We found that the tropical- to subpolar-species gradient in PLFA composition suggests adaptive regulation of biological membrane function and suggest that modiﬁcation of membrane composition is likely an important adaptive trait in insects and perhaps invertebrates in general.